Marius Grigonis had a career-night, in Zalgiris’ comeback win over Olympiacos. 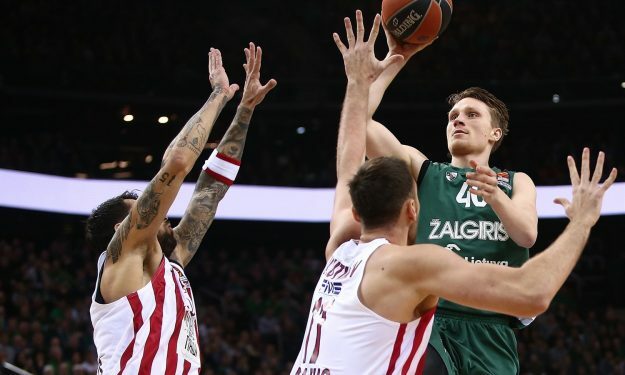 Zalgiris Kaunas protected the homecourt streak against Olympiacos Piraeus and Marius Grigonis had his best game in the Turkish Airlines EuroLeague competition. The 24-year old had a great game, and came up big for the winners in the final period, with key plays. He finished the contest with a career-high 19 points and was really efficient from the field (5/6 2FG) (3/4 3FG). He stayed in the court for 27:15, and also added one assist and a steal.